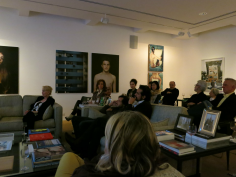 On March 22 2012, the haudenschildGarage invited artist Ming Wong in conversation with REDCAT assistant curator Aram Moshayedi. 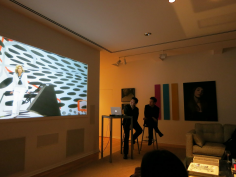 The conversation and video screening took place in collaboration with REDCAT Los Angeles and the exhibition, Ming Wong: Making Chinatown (February 5 - April 1, 2012). Wong screened excerpts from various projects including: Making Chinatown (multi-channel video installation, 2012), Life & Death in Venice (three channel video installation, 2010), Life of Imitation (double channel video installation, 2009), and In Love for the Mood (three channel video installation, 2009). Ming Wong has been recognized internationally for his ambitious performance and video works that engage with the history of world cinema and popular forms of entertainment. Working through the visual styles and tropes of such iconic film directors as Rainer Werner Fassbinder, Wong Kar-wai and Ingmar Bergman, Wong’s practice considers the means through which subjectivity and geographic location are constructed by motion pictures. Wong created a series of videos and scenic backdrops that center around the making of Roman Polanski’s seminal 1974 film Chinatown. Shot on location in the Gallery at REDCAT, Wong’s reinterpretation, Making Chinatown, transformed the exhibition space into a studio backlot and examined the original film’s constructions of language, performance and identity. With the artist cast in the roles originally played by Jack Nicholson, Faye Dunaway, John Huston and Belinda Palmer, key scenes were reenacted in front of printed backdrops digitally rendered from film stills and kept intact within the video installation. Making Chinatown is Wong’s first project focused on the American context of filmmaking and draws upon Polanski’s iconic film for its use of Los Angeles as a versatile and malleable character. Wong treats the film as a text through which he is able to inhabit and impersonate the qualities that are particular to the place it represents. Making Chinatown mimics and reduces the techniques of mainstream cinema in order to emphasize the theatrical qualities that underlie cinematic artifice. Among the Asian pavilions in the 53rd Venice Biennale, the real surprise comes from Singapore’s A Life of Imitation, curated by Tang Fu-Kuen, in Palazzo Michiel del Brusa. A series of poster paintings in the style of the 1960s, a photo collection of disappeared cinemas, re-interpretation of famous scenes form classical movies, the artist Ming Wong creates digital media installations that explore slippages in language, performativity and cross-cultural experiences through the appropriation of iconic moments in world cinema. Cinema as a collective memory also becomes a way of articulating the fluidity and conflicts of different gender, cultural and identity roles in a multiracial society such as Singapore.